Clarets defender Kevin Long has signed a new three-year deal at Turf Moor. The Republic of Ireland international, who joined the Clarets in January 2010 from Cork City, had one year left on his existing contract. Long, the club’s longest serving player, said: “I am delighted. It’s been going on for quite a while now so it’s nice to get it signed and look forward to the next three years. “It caps what’s been a fabulous few months for me. Coming into the team at the end of last season was great and them to make my international debut for Ireland over the summer was a dream. “Here at Burnley, we’ve secured another season in the Premier League, so this is a club going in the right direction and it’s a pleasure to be a part of that. 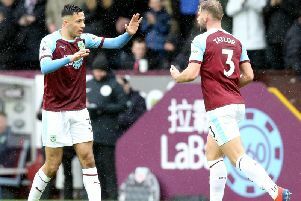 The 27-year-old centre back was rewarded for his patience with a first Premier League start in May’s 2-2 draw against WBA, which saw the Clarets ensure their top-flight safety. Long stayed in the side for the final two games of the campaign and was then called up for the first time by the senior Republic of Ireland squad, making his debut in a friendly against Mexico in the USA at the beginning of June, 2017 and starting for the first time a few days later against Uruguay. He then capped a remarkable few months by retaining his place and making his competitive international debut for Ireland in their World Cup qualifier against Austria.